2. Ustuf. Johan Petter Balstad, as platoon commander in 7./”Norge”. 4. Hstuf. Per Børresen, as doctor in I./”Norge” 2. february, 1944. 5. Ostuf. R.N. Børresen, as adjutant in II./”SS-Panzer Artillerie Regiment 11”. 6. Uscha. Alf Fjeld, in Rgt. ”Germania” after Cherkassy. 7. Uscha. 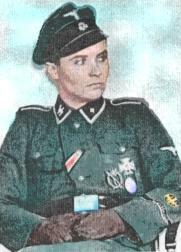 Fritjof Hegg, in ”SS-Panzer Regiment 5”. 8. Stubaf. Egil Hoel, in staff belonging to ” III.(germ.) SS-Panzerkorps“. 9. Ostuf. Sophus Kahrs, as commander of 1./SS-Skijegerbataljon ”Norge” in July 1944. 13. Uscha. Per Meidell, in 14. (Pak)/DnL 1943. 14. Ustuf. Gösta Myhrvold, in 9./”Norge” 22. February, 1944. 15. Rttf. Arne Nilsen, in I./”Nordland”. 17. Rttf. Per Ramberg, in 10./”Norge” , oktober 1944. 18. Uscha. Paul Sæther, in „SS-Flak Abteilung 5“,1944. 19. Uscha. Willy Schakesby, with Reg. “Norge” in 1944. 23. Ostuf. Harald Normann Sødahl, As commander in 6./”Norge” in March 1944. 24. Rttf. Lage Søgaard, in Pak-Platoon, 12./”Norge”, February 26,1945. 25. Rttf. Hermod Tuft, in 4./”Westland”. 27. Rttf. Helge Tollefsen, in 8./”Germania” at Cherkassy. 29. Hstuf. Frode Halle, Time of award unknown. 30. SS-Ustuf Fredrik Jensen, in July 1943, as platoon commander / 7.Company, Div Wiking, after the battle at Andrejevka / Ukraine. All pictures/material unless otherwise stated, are owned or supervised by NDWW2/NUAV's webmaster. Iron cross picture is copyrighted Photo©Rusfront. You are not allowed to copy, publish or in any way distribute material from these pages without the webmaster’s written permission.This site do not represent any kind of political statement, it is made by people with the historical interest of Norway in the period between 1940 - 1945. Copyright 1999, 2000 © Kurt Monsen.